↑ "List of Major Shareholders". Singapore Airlines. สืบค้นเมื่อ 2009-03-04. ↑ "Singapore Airlines Annual Report 07/08" (PDF). Singapore Airlines. pp. 88, 171. สืบค้นเมื่อ 2009-03-04. ↑ "SIA gets new CEO". Channel NewsAsia. สืบค้นเมื่อ 14 September 2010. ↑ "Boeing jetliner tries for record for longest nonstop flight". Seattle Post Intelligencer. 2005-11-09. สืบค้นเมื่อ 2007-01-01. ↑ The first non-stop flight between Singapore and Los Angeles, USA, Singapore Infopedia (National Library Board of Singapore), retrieved on 1 January 2007. ↑ "WATS Scheduled Passengers Carried". International Air Transport Association. 2005. ↑ "Top global firms better at engaging staff". The Business Times. 2010. ↑ "Airlines' Reputations Hinge On the Basics, Study Shows" (PDF). The Wall Street Journal. สืบค้นเมื่อ 2007-01-02. ↑ "Singapore Airlines raises the bar for luxury flying". Seattle Post Intelligencer. 2007-01-18. สืบค้นเมื่อ 2007-01-18. ↑ "Our achievements". Singapore Airlines. สืบค้นเมื่อ 2008-02-02. ↑ "Airbus wins $2.7B deal". Ottawa Citizen. ↑ "Airline Ground Positions." Singapore Airlines. Retrieved on 11 July 2009. ↑ "Telekom Malaysia and Malaysia Airlines Synergise Business Relationship". Telekom Malaysia Berhad. สืบค้นเมื่อ 2007-09-03. ↑ "The Creation of Singapore Airlines". Singapore Airlines. สืบค้นเมื่อ 2007-07-01. ↑ "Life". Asiaone. สืบค้นเมื่อ 2007-02-01. ↑ "Past, Present & Moving Forward". Malaysia Airlines. สืบค้นเมื่อ 2007-02-01. ↑ "The Creation of Singapore Airlines". Singapore Airlines. สืบค้นเมื่อ 2007-02-01. ↑ "Yong Nyuk Lin's speech" (PDF). National Archive of Singapore. สืบค้นเมื่อ 2008-09-25. ↑ 24.0 24.1 Poljak, Vesna (2006-02-21). "Australia rebuffs bid by Singapore Airlines". International Herald Tribune. สืบค้นเมื่อ 2008-08-06. ↑ "Singapore Airlines chief furious at A380 delay, threatens to sue Airbus". AFP. 2005-08-07. ↑ "First A380 Flight on 25–26 October". Singapore Airlines. 2007-08-16. สืบค้นเมื่อ 2007-08-16. ↑ "Superjumbo in Sydney on maiden flight". ninemsn. 2007-10-25. สืบค้นเมื่อ 2007-10-25. ↑ "Singapore Airlines to cut 17 percent of fleet". AFP. 2009-02-16. สืบค้นเมื่อ 2009-02-16. ↑ "Air France, Singapore Air Adjust Fleets To Recession". AFP. 2009-02-16. สืบค้นเมื่อ 2009-02-16. ↑ McDowell, Edwin. "Delta Seeks to Expand Its Tie With Three Airlines in Europe". The New York Times. สืบค้นเมื่อ 23 May 2010. ↑ Chen, Shu-Ching Jean (2007-07-11). "Branson May Spread Wings Unbound In Asia". Forbes. สืบค้นเมื่อ 2007-09-03. ↑ "Singapore Airlines Annual Report 2006-07" (PDF). Singapore Airlines. สืบค้นเมื่อ 2007-09-06. ↑ "Huge losses hits Singapore Airlines". AFP. The Age. สืบค้นเมื่อ 25 February 2011. ↑ 51.0 51.1 "Annual Report". สืบค้นเมื่อ 2008-02-03. ↑ 52.0 52.1 "Annual Report 07/08" (PDF). สืบค้นเมื่อ 2008-05-18. ↑ "Financial Results For Year Ended 31 Mar 2010" (PDF). Singapore Airlines. 2010. สืบค้นเมื่อ 2010-05-24. ↑ 54.0 54.1 "Financial Results For Year Ended 31 Mar 2011" (PDF). Singapore Airlines. 2011. สืบค้นเมื่อ 27 March 2012. ↑ Heracleous, Loizos (2006). Flying High in a Competitive Industry: Cost-effective Service Excellence at Singapore Airlines. McGraw-Hill. ISBN 0071249648. ↑ "The Creation of Singapore Airlines". Singapore Airlines. 2007. ↑ Jan Dahinten (2007-01-19). "Singapore Girl faces makeover as airline looks to update image". The Scotsman. ↑ "Australia rules out opening up Qantas' trans-Pacific route to rivals". Channel NewsAsia. 2007-01-08. ↑ Rochfort, Scott (2005-01-25). "AirAsia chief backs Qantas on LA route". Sydney Morning Herald. สืบค้นเมื่อ 2008-04-01. ↑ "SIA codeshare destinations". Singapore Airlines. สืบค้นเมื่อ 2009-04-09. ↑ "Global Icon — the Singapore Girl". Singapore Airlines. สืบค้นเมื่อ 2007-10-08. ↑ "Singapore Airlines Unveils The World's Best Flying Experience". Singapore Airlines. 17 October 2006. ↑ "World's Best Flying Experience Begins Tomorrow". Singapore Airlines. 4 December 2006. 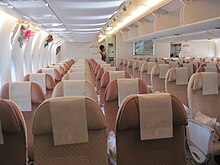 ↑ "Economy Class Cabin — Singapore Airlines". Singapore Airlines. สืบค้นเมื่อ 2007-05-06. 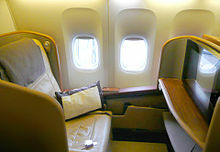 ↑ "Singapore Airlines Redesigned Economy Class". Singapore Airlines. สืบค้นเมื่อ 2006-10-17. ↑ "Singapore Airlines to introduce Airbus A330 on Australian routes". PopSci.com.au. 2009-01-23. สืบค้นเมื่อ 2009-01-23. ↑ "Singapore Airlines and Connexion by Boeing Finalize Plans for High-Speed, In-Flight Connectivity". Boeing. 2004-12-02. ↑ Daniel Altman (2005-10-14). "Lessons in Flight around the World". International Herald Tribune. ↑ "Singapore Airlines Presents Live Text News And Expands Inflight Games Selection". Singapore Airlines. 2005-12-12. ↑ "Singapore Airlines New IFE System From Panasonic" (Press release). Singapore Airlines. September 23, 2006. ↑ "Silver Kris Lounges – Worldwide Lounges". สืบค้นเมื่อ 17 August 2009. ↑ "Your KrisFlyer Benefits at a Glance". สืบค้นเมื่อ 2007-04-22. ↑ "The PPS Club". สืบค้นเมื่อ 2007-04-22. ↑ "PPS Club Privileges at a Glance". สืบค้นเมื่อ 2007-04-22. ↑ "About KrisFlyer Elite Silver – Singapore Airlines". สืบค้นเมื่อ 2007-04-22. 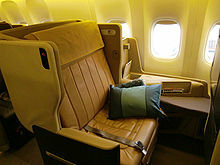 ↑ "About KrisFlyer Elite Gold – Singapore Airlines". สืบค้นเมื่อ 2007-04-25. ↑ "Terms and Conditions". สืบค้นเมื่อ 2007-04-22. ↑ Paulo, Derrick (2007-03-13). "Priority perks for fewer SIA flyers". Channel NewsAsia. สืบค้นเมื่อ 2008-02-02. ↑ "PPS Club Membership — Singapore Airlines". สืบค้นเมื่อ 2007-04-25. ↑ 93.0 93.1 93.2 "Solitaire PPS Club/Solitaire PPS Club Life Membership". สืบค้นเมื่อ 2007-04-22. ↑ "Changes to the PPS Club Programme — Effective 1 September 2007". สืบค้นเมื่อ 2007-04-22. หน้านี้แก้ไขล่าสุดเมื่อวันที่ 11 มกราคม 2562 เวลา 10:35 น.